Pounds or Inches Lost: I lost 100 pounds! I went from a size 18-20 to a size 4-6. 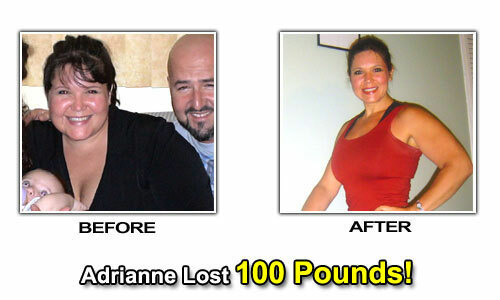 Adrianne’s Weight Loss Success Story! I have a family history of obesity but it seems to be that lifestyle choices and mental health are what have dictated our weight. My grandmother died young of breast cancer, my grandfather died of colon cancer and my mother died young of ovarian cancer. From what I’ve read, these cancers are caused in part by lifestyle and nutrition and some from obesity. My mother was a svelte and beautiful woman in her premarital, pre-baby years but then came the stress of life and so did the emotional eating and the pounds. I remember her always struggling with her weight and never being happy with herself. I also remember her being very stressed, depressed and snacking “emotionally”. Did I get it from her? Well, my whole life I’ve been down the same road she was. At 15 years old, after I had bilateral hip dislocation (from being obese), my mother started a weight loss plan called “Herba-Life” and she was doing so well. She put me on it and I lost so much weight! BUT, it turns out SHE was becoming anemic because she just was not ingesting enough vitamins from just a liquid shake diet. BUT, I started to lose the weight! As the weight came off, I became more and more confident and interested in being athletic. I started doing little aerobic routines at home and going for bike rides all over Hialeah and then being very careful of my caloric intake and expenditure. I would get on the scale and see the pounds drop so quickly and it would just totally motivate me to continue eating less and exercising more. Soon, I became anorexic and weighed only 100 pounds on a large frame. BUT, it was so exciting because we were very poor and I was able to go to thrift shops and buy really cheap clothes for very little money. The catch was that the nice clothes were all size 2 or size 0. BUT, I was fitting into them, yey! So, I was anorexic and how did I get out of it? I really don’t remember. I think what happened was I rediscovered food and went to the opposite spectrum and got overweight again. Thank God because I would’ve died if I didn’t start eating again. So, when I graduated high school, I was fat! Then, I got married and so many self esteem issues starting coming to the surface. Along with the hardships of married life, buying a new house together and owning a business together. All the stresses made me start putting the weight on more and more until I was into my 29th birthday. I’ll never forget, my brother and sister asked me if I was happy because they saw how I had bloated up and I guess they figured I was having problems. I got defensive but it made me realize that for so many years, I was eating to cover up the pain of an unhappy marriage. So, in 1999, I decided to lose the weight and I did. 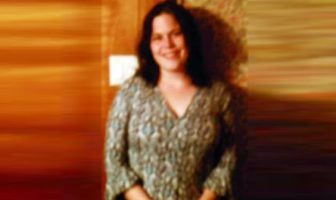 I was down from a size 18 to a size 6 by the time I filed for divorce in November, 1999. I was ready for the new millennium! New millennium, new life! I was divorced and on my own for the first time since I was 19 years old! I danced every night, had plenty of free time to exercise and was in the singles scene! I went back down to a size 4. I was 130 pounds at 30 years old! My 25 year old boyfriend couldn’t believe that a 30 year old could look so good! After enjoying my fit self and being single for a year, I met my current husband. He was very athletic and so was I. I made that a priority when dating. I really wanted my partner to be athletic and keep up with me. So, we were both fit, athletic and very conscious of our health and fitness! BUT, he was Italian and a great cook, so we started doing the whole eating out at restaurants and staying in because we were so in love and just got lazy and FAT! We bought a house and the stress started piling on and then we had kids and the stress REALLY started piling on. We both gained a lot of weight! When I was young and overweight, I had asthma which reoccurred as my weight increased. Also, I developed gall bladder sludge, herniated lumbar disk, hiatal hernia, sciatica, irregular periods and bad PMS. These were all attributed to my obesity. I stopped exercising and continued having meals out and eating my husband’s rich and delicious Italian cooking. Then we decided we wanted to try to have kids. OK, so we tried but it didn’t happen. I went to a fertility specialist who said that because I was obese, I had developed polycystic ovaries and therefore would have difficulty conceiving. So, I didn’t like meds and decided to ignore her. I thought maybe if I lost some weight, it would help. I lost 20 pounds and guess what? I got pregnant! So, prego with my first kid I gained like 45 pounds (OK, maybe 60). I was supposed to only gain something like 25 pounds but I gained much more. Then the stress of raising a kid hit me. Every time I got stressed out, I popped a Dove dark chocolate bar in my mouth. I gained lots of weight. Trying for baby #2 caused more stress! I was overweight AGAIN and it wasn’t happening fast enough. 8 months after giving birth to my first baby, I was prego again! UGH! So, I said why even try to lose the weight from the 1st pregnancy and ended up gaining even more weight (another 30-35 more pounds). I was getting really heavy now. 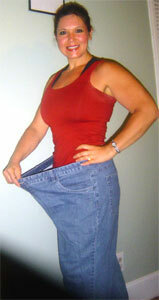 I had my 2nd baby and weighed 235 pounds and was a size 18-20 (wow)! My doctor’s notes read “severely obese”! I remember looking in the mirror (which I rarely did) and thinking how did I get this big? How and when will I ever lose this weight? I just hated myself for being so weak and lacking self control over food and for being lazy! One day, I just thought, I CANNOT go on like this! None of my clothes fit! I’m uncomfortable in social situations and I cannot even find clothes to wear unless I go buy more and more. So I decided it was time to commit! I joined the gym at my husband’s work and he generously gave up his lunch hour to watch the boys while I exercised for an hour. I went every day religiously because I knew that the boys could get sick or appointments could get in the way and I may have to take an unscheduled day off. Meanwhile, I wanted to feel comfortable and confident. I went to Lane Bryant and I bought 2 pairs of jeans that made me feel good and I didn’t feel depressed in them. I bought some workout clothes that didn’t make me feel like a blimp. I started eating for nutrition and NOT for comfort! I realized that if I was working so hard at the gym, then I didn’t want to waste it by overeating! So, I DID start counting calories. I realized that I needed to lose X amount by my 38th birthday which was February 2009. I wanted to be at least back to a size 8 so I calculated a slow and realistic weight loss of 5 pounds per month (1 pound equals 3500 calories). I did it! I started eating lots of really filling veggies like brussel sprouts, broccoli, asparagus, spinach, salads, etc. I ate protein sources like fish, tuna, Boca Burgers, etc. By controlling my caloric intake and expenditure, I was on track losing 5 pounds per month. I did 1 hour of cardio per day and started with the treadmill, then elliptical, then Stairmaster, then Concept 2 rowing machine and just kept mixing it up! I was listening to my body also! You have to listen to your body! I would give myself daily treats like some chips and some wine on the weekend. But, I still kept track in my mind the caloric intake to make sure to work it out! The weight started coming off and people at the gym were noticing and making comments and that just motivated me even more and more. Until I reached my goal and even surpassed it! I don’t know what else to say! I am more energetic for my kids! I am more confident as a woman and mom and I am feeling very healthy! I LOVE to exercise and I DO feel guilty putting “crap” in my mouth! I think before I eat. I am being very aware of what goes in my mouth and how much I move. I am a very confident and healthy person now. I am happy that I have my “emotional” eating under control and didn’t succumb to laziness! My health problems have disappeared and the only pain I feel now is just from strenuous workouts. The health and emotional benefits that I’ve gained are important BUT most important is that I have been teaching my kids the joy of healthy eating and exercise. They love to eat broccoli and love to exercise. This is a very important part of life that I want them to grow up with as it just becomes second nature to eat well and exercise. Losing the 100 pounds wasn’t easy but it sure makes 5-10 pound losses seem like a piece of cake (yumm)! IT IS DOABLE! YOU JUST HAVE TO WANT IT ENOUGH! Just a side note: This might be something that moms can relate to. I felt a lot of guilt and had people impose guilt on me for being so “selfish” and taking time for MYSELF to exercise. Those people did NOT understand that I was NOT being selfish because the repercussions of my obesity affected my family also, so they are also benefiting from the results which are a happier, more energetic and more patient mother, wife, and sister. Also, you wouldn’t believe how far a compliment can go when you see someone who has accomplished something, be it weight loss or any other accomplishment. It is so motivational to hear the words and actually realize that others have noticed. So don’t be stingy, shy or even envious or jealous. GIVE THEM A COMPLIMENT! Adrianne’s Weight Loss Questions & Answers! When I looked in the mirror and when my doctor noted in the file I was “obese”. Daily exercise and constant “aware” eating. Making the time for exercise and making the time for eating healthy. So far, just 1 month. I do it by continuing the same routine. I respect and love myself more and know that my kids are getting a good role model. All the motivational weight loss success stories are amazing! Watch what goes in your mouth! Weigh yourself ONLY once per month, period! Don’t drink alcohol and eat! Adrianne’s Weight Loss Eating Plan! Peanut butter and low calorie high grain bread. Brussel sprouts and boca burger or fish and broccoli. Big salad with romaine lettuce, spinach leaves, carrots, tomatoes and low-fat dressing. Apples, hummus and carrots. Occasional chips and wine. Alternating 40 minutes of stairmaster and rowing or 60 minutes of just stairmaster.